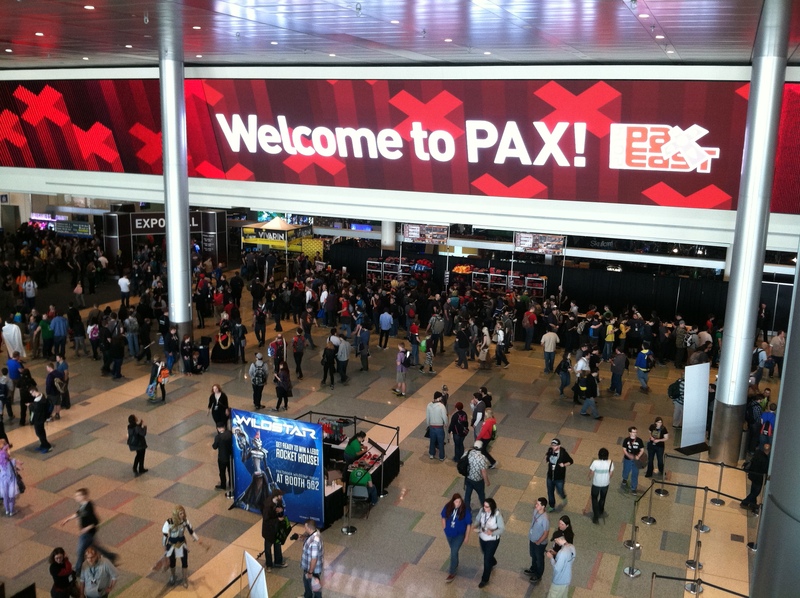 Well, this year I was fortunate enough to score two day passes to PAX East in Boston, MA for Friday and Saturday. If you watch The Big Bang Theory, and have seen the episode where all of them are waiting with laptops in hand to try and score passes to ComicCon, you get an idea of how hard it actually is to get any passes to PAX at all! I’m afraid that with it’s exploding popularity and demand, it might be the last time I can get them online through “regular” means. I certainly hope not though. So, what is PAX like? I liken it to a carnival of game delights! The sights, the sounds, the long lines! Yep, definitely a carnival atmosphere…and that’s just the exposition floor. There is a whole slew of convention halls, side rooms, and areas that are packed with tabletop gaming areas, LAN stations, keynotes, panels and discussions…all centered around games. Not to mention tons of merchants and suppliers of anything even remotely associated to video and tabletop gaming that you could ever think of…plus much more! Oh, and did I forget to mention the amazing cosplayers wandering the convention halls? Yeah…there’s that too. Personally, I was there to mainly focus on attending several panels geared towards indie game development. I won’t bore you with a play-by-play, as I’m sure there are plenty of write-ups and YouTube videos covering the multitude of speakers that were kind enough to share their wisdom and knowledge with the rest of us would-be indie developers. Instead, I’ll mention a few key takeaways that I went home with. First off, I learned that even the best indie developers created their first games…whether they were a huge success, or more often, a laughable crash-and-burn…by just doing it! You can plan, re-iterate, re-group, and re-analyze over and over again…but if you do it too much, you will never finish what you set out to start. As a well-known sneaker company put it….”Just Do It”! Whatever it is, for better or worse, just get it done. If you fail, learn from that failure, and apply it to your next attempt. The only true failed games are the ones that are never made. Secondly, games can be whatever you want them to be. They can be adventurous, scary, educational, or just plain silly. The most important thing about them, however…and this is key…is that it must be fun! A game that is not fun is just an exercise in hand-eye coordination, of memorization, of repetition, etc. Without being fun, what is the point?! 1. “Our ability to let a person walk a mile in someone else’s shoes”. 2. “Our ability to let the player explore a space of possibility and discover for themselves rather than be told”. 3. “Our ability to educate without teaching”. These are the takeaways that I will keep close to heart, and in mind, as I continue down the development road for Legacy. For I hope that our legacy will be guided towards a reality that incorporates as many of the ideals and excitement that I have experienced at my time at PAX East as humanly possible. This entry was tagged #legacythevideogame, #PAXEast, Boston, indie videogamedevelopment, Pax East 2014. Bookmark the permalink.